Should Your E-Newsletter Look Like Your Website? How to design an email newsletter—does it matter? Should it look like your website? Should it look like an email you send to a friend? A combination? It depends. Some look just like the company’s website — often flashy, full of images, linkable sections, 2-3 columns, etc. Others may have an image for a masthead, but the rest is plain text. Before you automatically assume the fancy ones full of images are best, think about this: Most of the e-newsletters I subscribe to from professionals in my field — expert copywriters and marketers. Almost without exception they look more like an email than a website: maybe a masthead at the top, but otherwise pretty much text-only, with a salutation and a signature. Most of these people make well into 6-figures every year. I wonder if they know something? How do I want my audience to view my e-newsletter? A screen full of images that looks like your website looks like a sales pitch. A mostly-text newsletter with a personal greeting looks more like a personal email. If you’re a huge retailer and your audience is always looking for the next great sale, an ad is fine. If your audience doesn’t want to get sales ads every week, but would love helpful information, you’re much better off with a text-based newsletter. What’s the purpose of my e-newsletter? Again, if you’re a retailer and you know every sales pitch brings your customers in by the droves, by all means sell using the first approach! But if you’re a service provider or a B2B company, you know it takes a lot more than one sales ad to bring customers knocking. Your goal is to become their trusted business partner. Someone who continually offers useful information. When they’re ready to buy, they’ll think of you. You’re better off using the second approach. How do I know which approach will work best? Take advantage of your e-mail service provider’s A/B Split Testing feature. It will randomly split your email list in half and send one version to each half. Your response rates will tell you which to go with. If your goal is to be that helpful business partner to prospects and customers, you’ll want to include useful and valuable information regularly. Keep your words front-and-center. Several images and links can end up being nothing more than clutter and distraction. This is especially true for your mobile users. Considering an e-newsletter can be one of your most valuable marketing tools, it pays to stop and think about your answers to these questions. If you already have an e-newsletter that’s working for you, let me know which format you use in the comments section below. 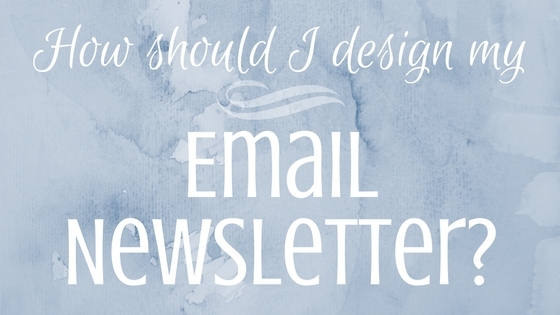 Would you like help starting or revising your email newsletter? Let’s get started today!